You may remember my former post on this house, that showed all of the professional photographs taken. Click here if you have not. They are a must-see! Anyhow, I am posting some more pictures, as promised! 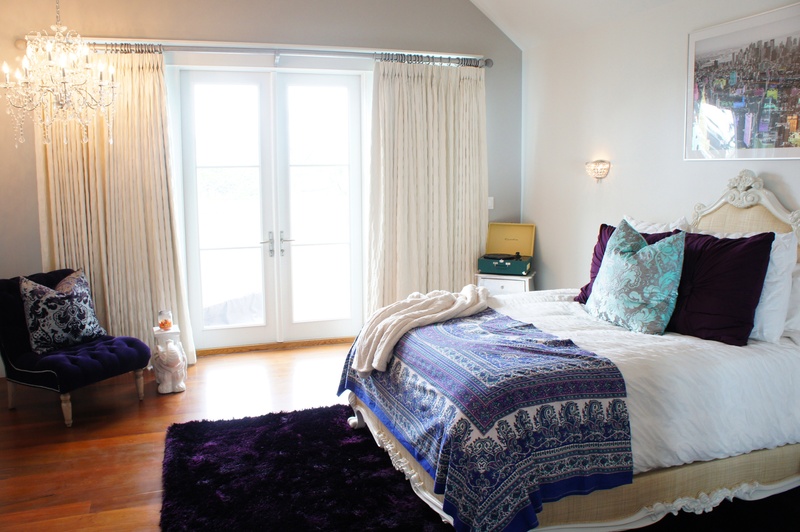 I was able to photograph all of the bathrooms and all of the bedrooms! There were too many things I wanted to show you! 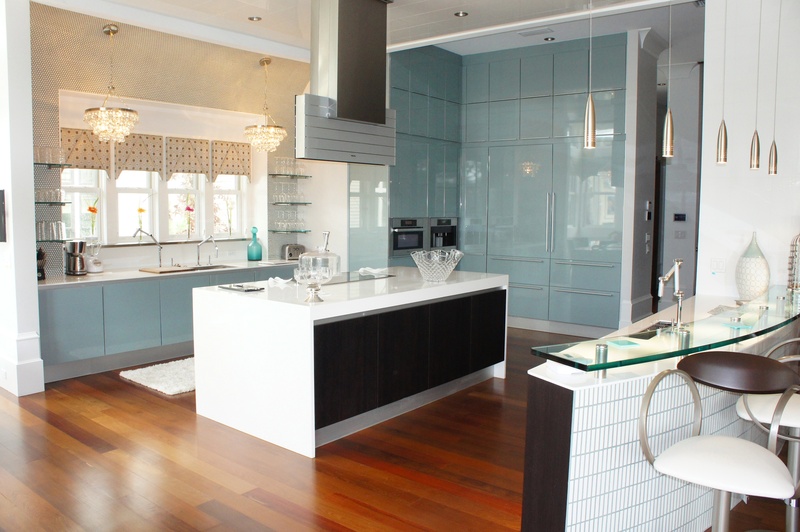 Here you can see how beautifully the Ipe wood floors contrast with the coolness of the Poggen Pohl blue glossy cabinets. 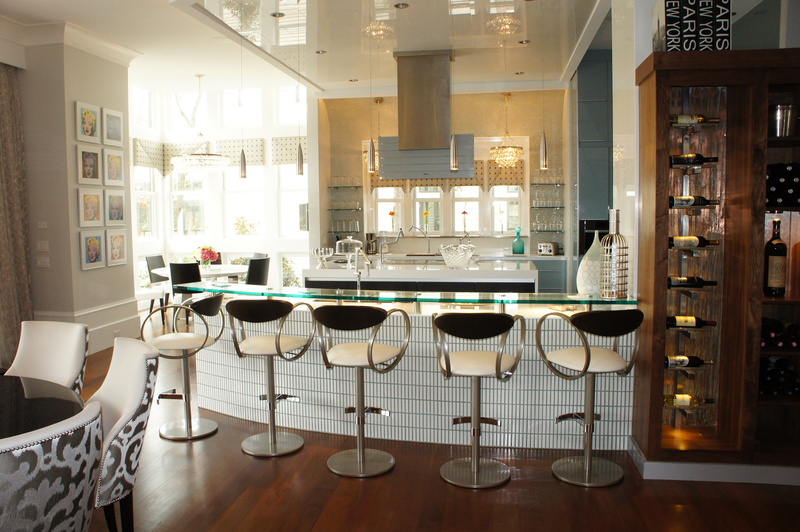 Notice the island, with its white countertop waterfalling down the sides for a modern and lightening effect. This is the Kitchen, the heart of any home! This one is particularly beautiful and inviting. This is what you a see upon entering the front door. Dazzling! 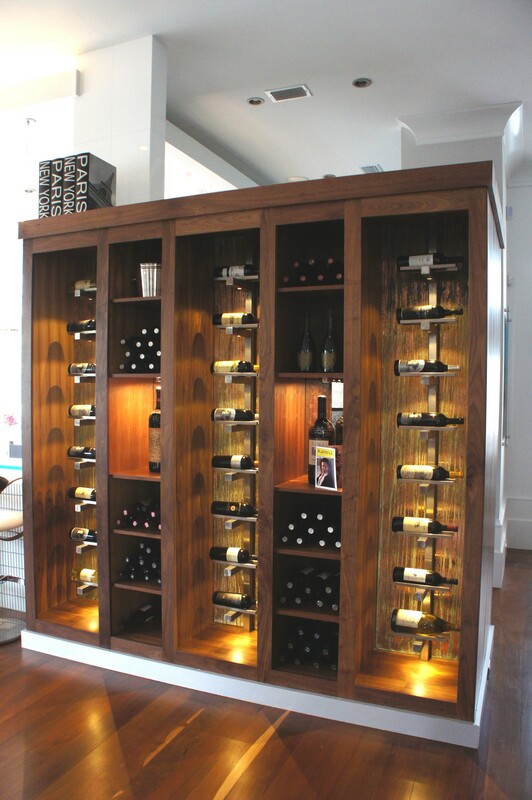 This wine storage and display area was custom designed to serve, not only as functional storage, but also a clever way to separate the Kitchen from the Entry, without feeling closed off. 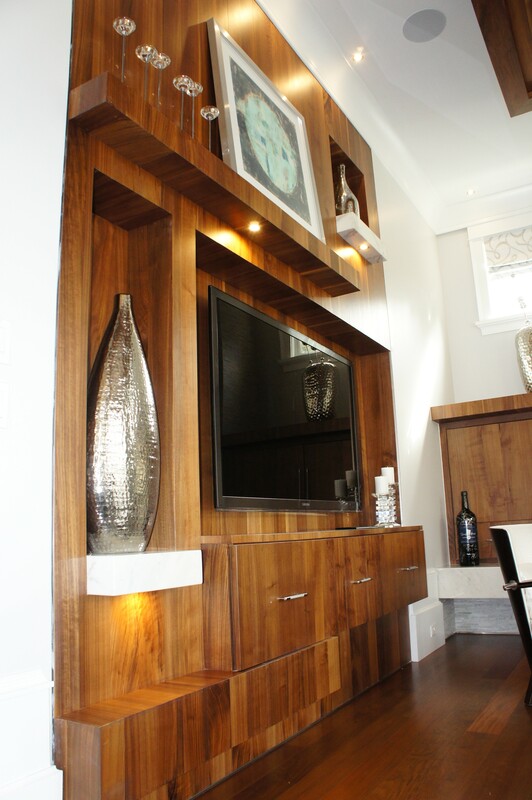 The warmth of the wood and the accent lights radiates out into the room. Here you can see the texture that the copper patina panels add. 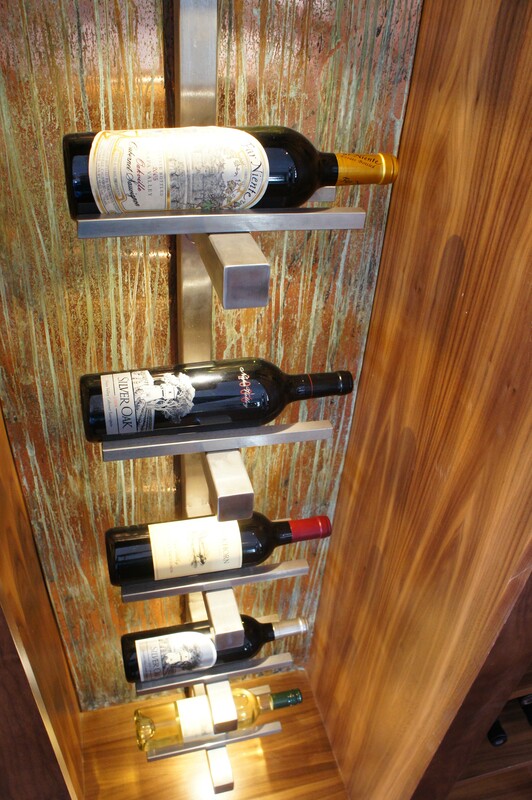 The vertical stainless rack is backlit so that the wine labels are highlighted. 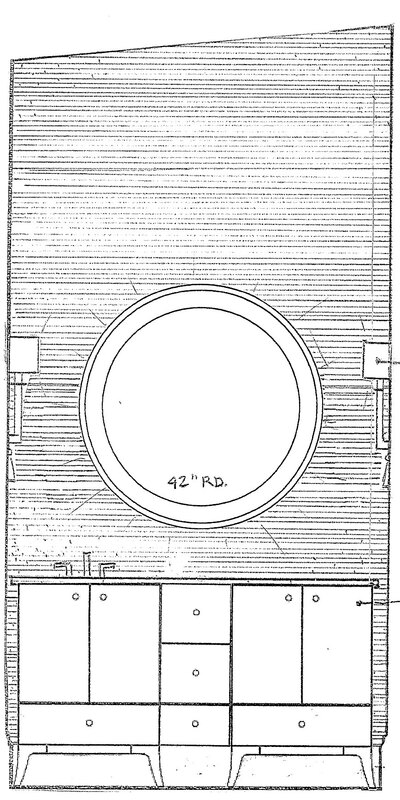 In the Dining area, there is a round disc suspended from stainless bars, with recessed glowing lights. It appears to hover over our 72″ dining table. 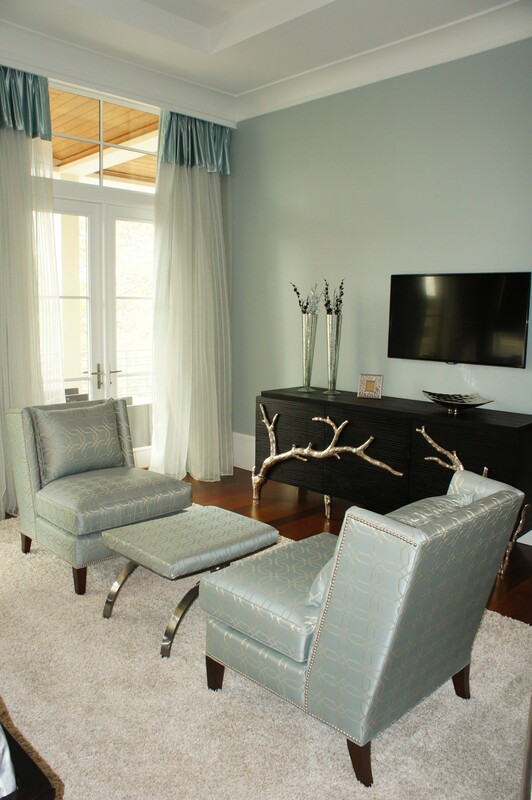 The chairs bring in some warmth with its leather seats and gray printed Romo fabric outbacks. 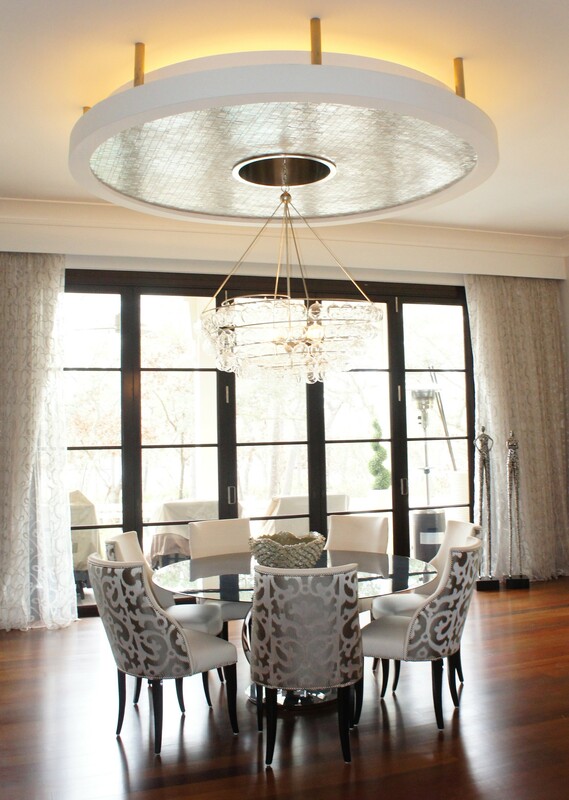 I love this dining chandelier, with its swirling rows of glass balls. 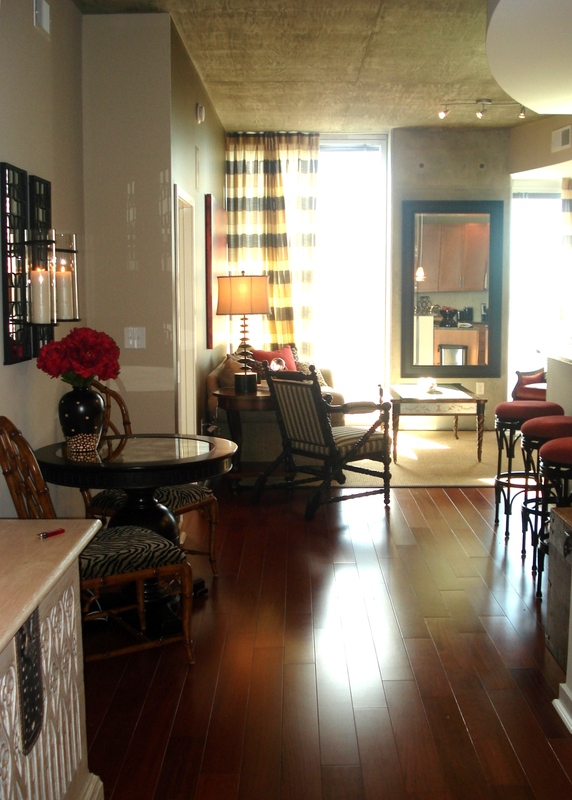 Here you can also see the ceiling treatment we used in the Kitchen. It is a product called White Ice, which is a man-made version of white thassos granite. We loved the reflective quality it has, and the way it mirrors the lights from the kitchen windows. 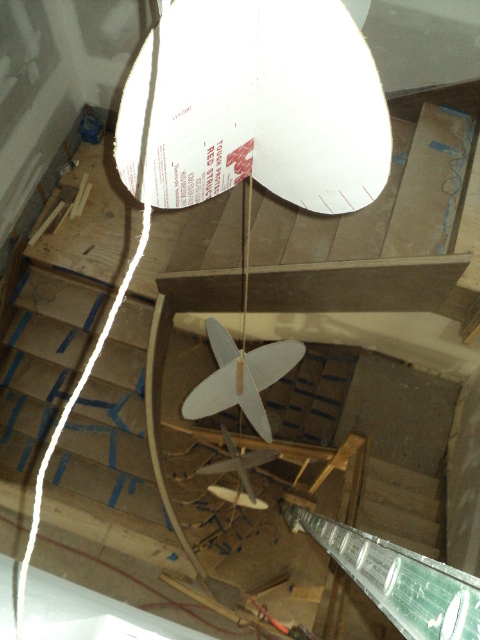 This photo shows how important it is to think about your ceiling plane when designing. 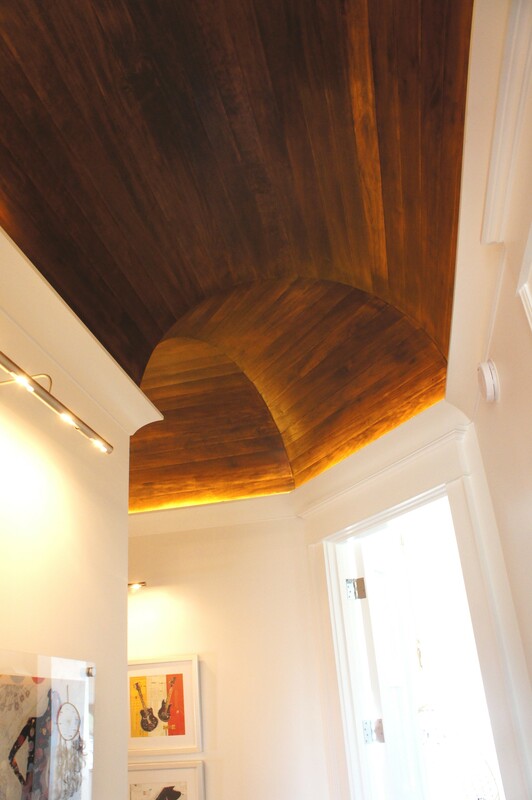 Adding a contrasting treatment, a soffit or recessed cove can emphasize an area, and be aesthetically pleasing to the eye. 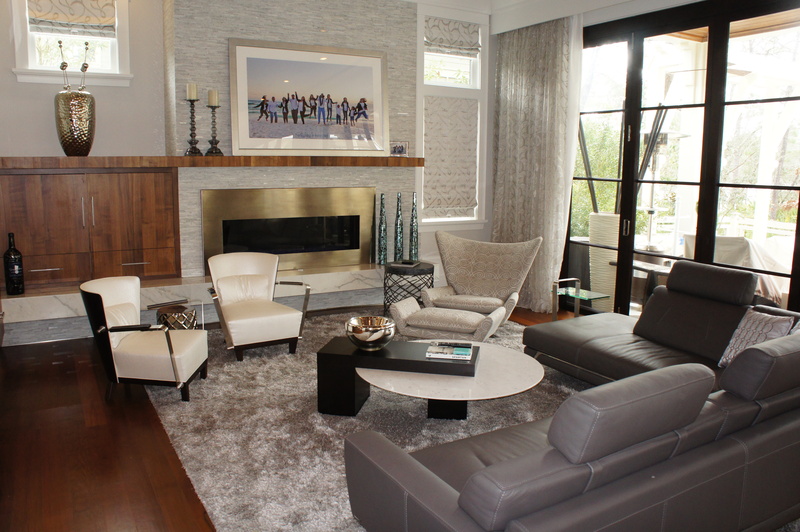 Here you can see how the lightness of the room can handle the darkness and weight of the charcoal gray leather sectional. 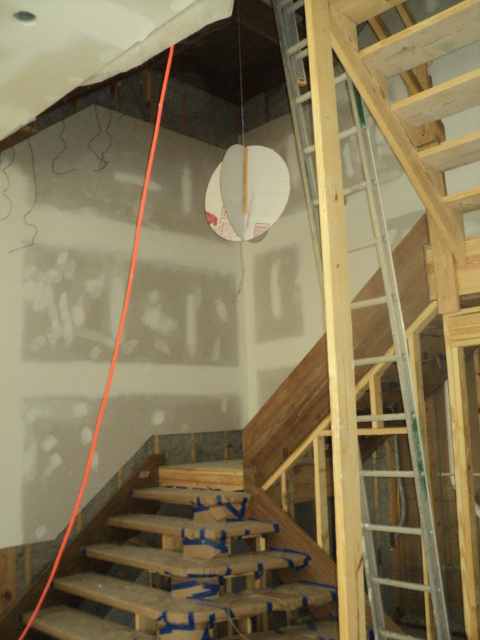 This is a view of the Living and Dining areas, as they appear from the Entry/Stairwell area. 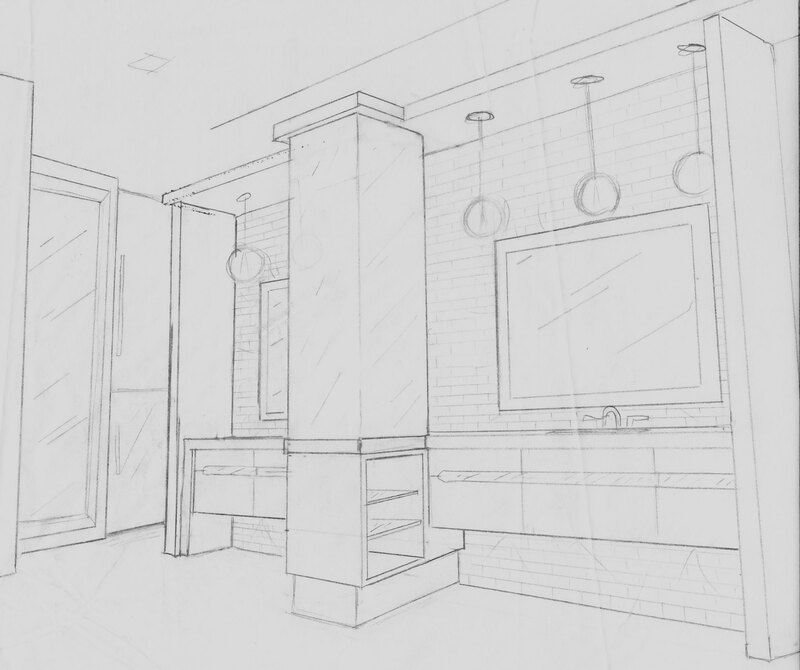 Here is my original design sketch. 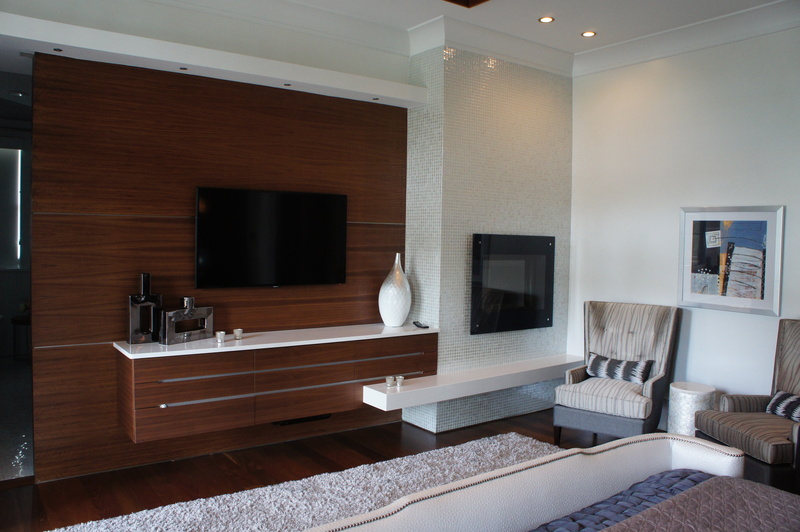 I designed this media wall to be asymmetrical, with mantle, shelves and t.v. console at varying depths. It is made from quarter sawn maple in a walnut finish. Instead of trying to make the t.v. 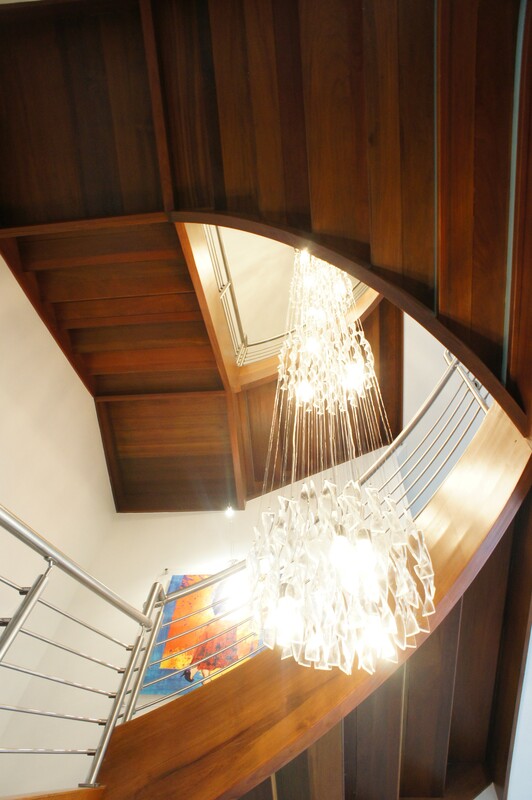 the focal point, we succeeded in making that whole area a large sculptural feature. The fireplace surround is covered in horizontal pieces of Carrera marble with varying depths and alternating polished and tumbled finishes. The hearth is made from slabs of Carrera marble. 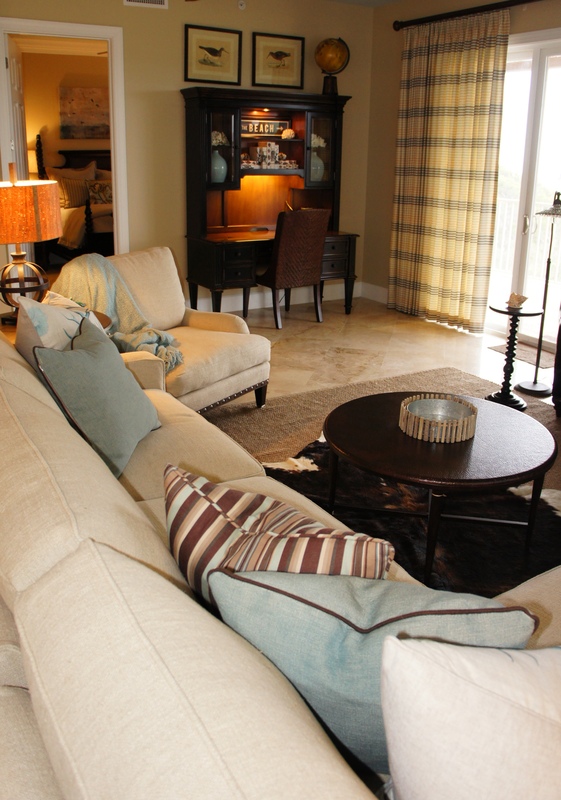 This white helped balance all the wood tones in the room. Here is my original design sketch for the room. 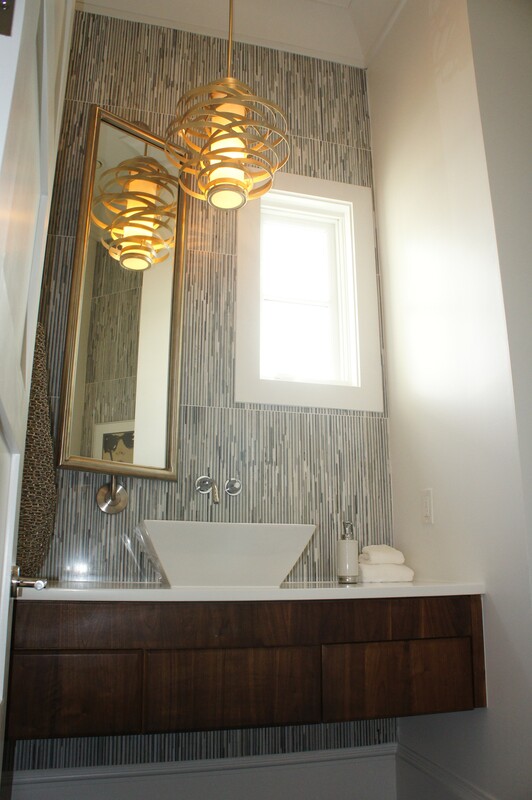 This Powder Bathroom has custom floating cabinet, black granite counter top, glass backsplash and accent pendant light. This picture shows the different curves and lines, as well as the palette of textures I used in the Powder Bathroom. 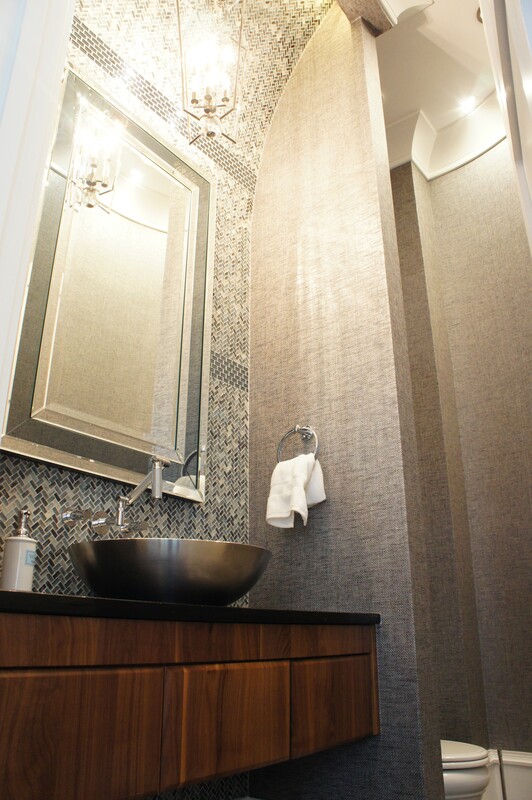 The walls are a blue-gray grasscloth. 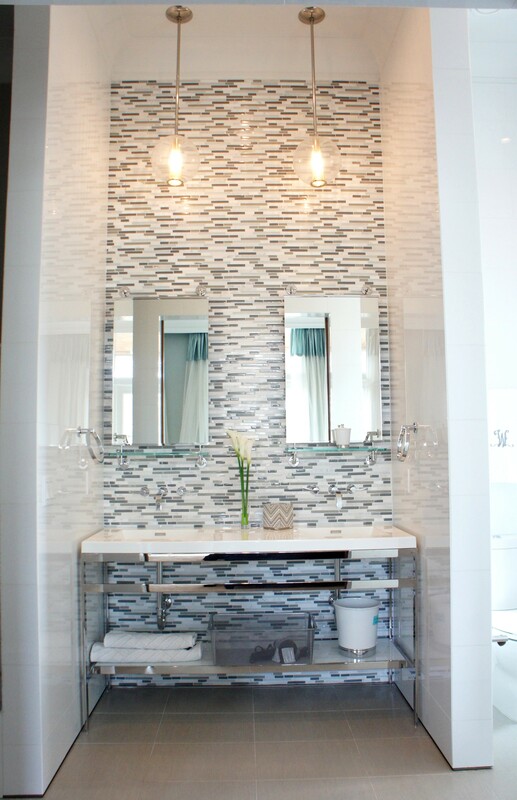 The main tile on the vanity wall is a glass herringbone mosaic tile, separated by bands of smoky mirror staggered tiles. 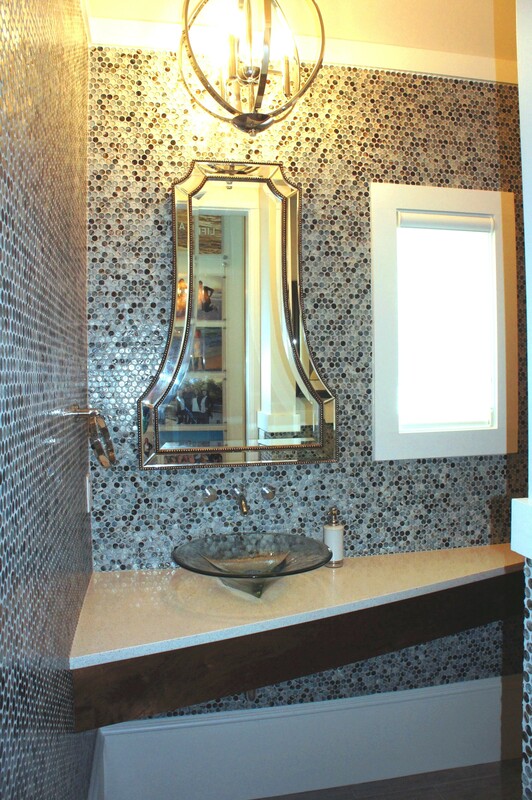 The top of this vanity wall curves out and ends in a recessed cove that lights up the wall tile and shows off the architecture. 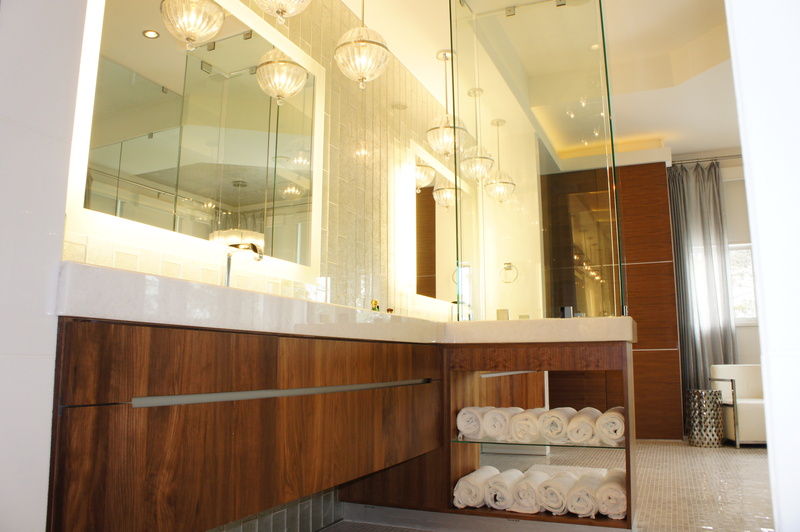 This is the coolest auxillary bathroom I have ever had the pleasure to design! This bath is accessible near the kitchen and garage. 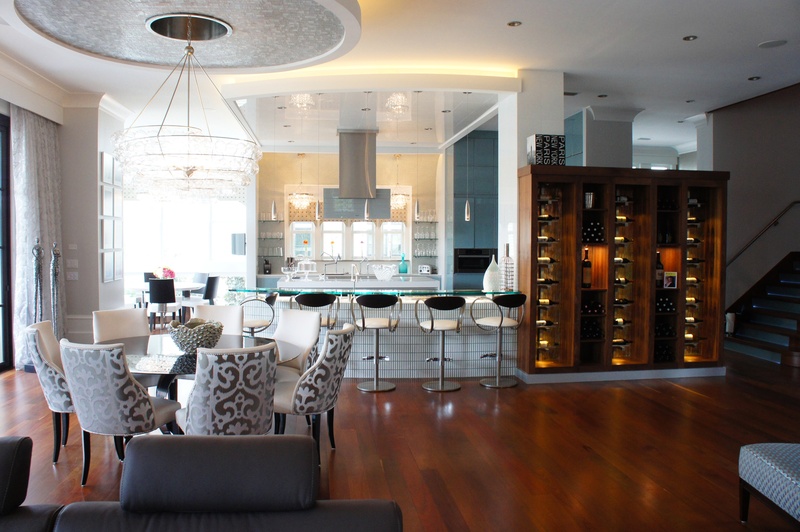 The slanted countertop provides more open space, looks light and airy, and gives more counter space. 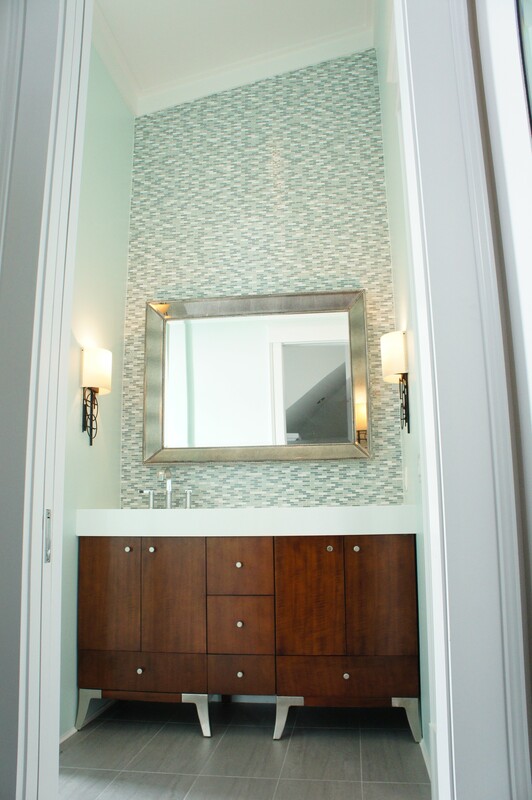 The walls are blue glass Lunada Bay penny round mosaic tiles. This is an open desk area just off of the kitchen. 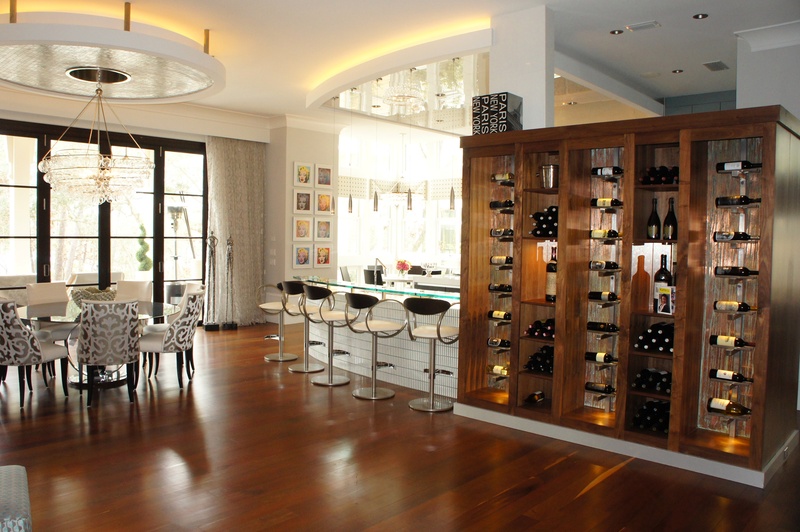 Although this is an open room, it felt very cozy and intimate. 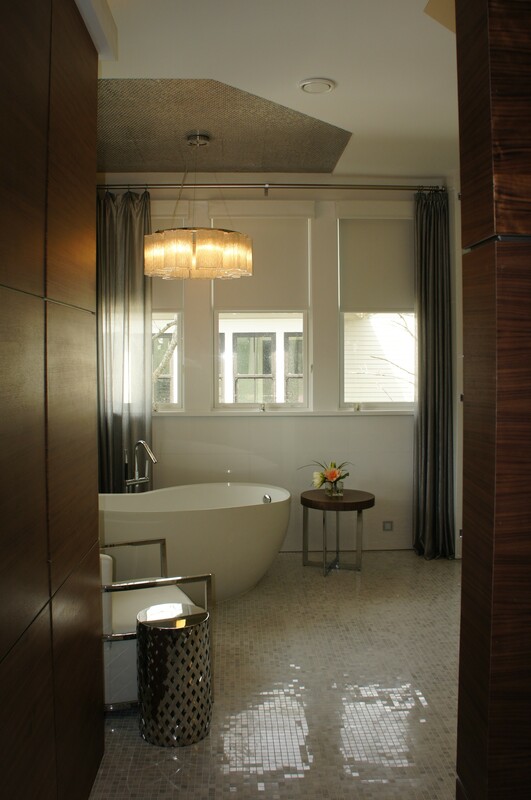 I accented the walls with a champagne mica wall covering that reflects the light. 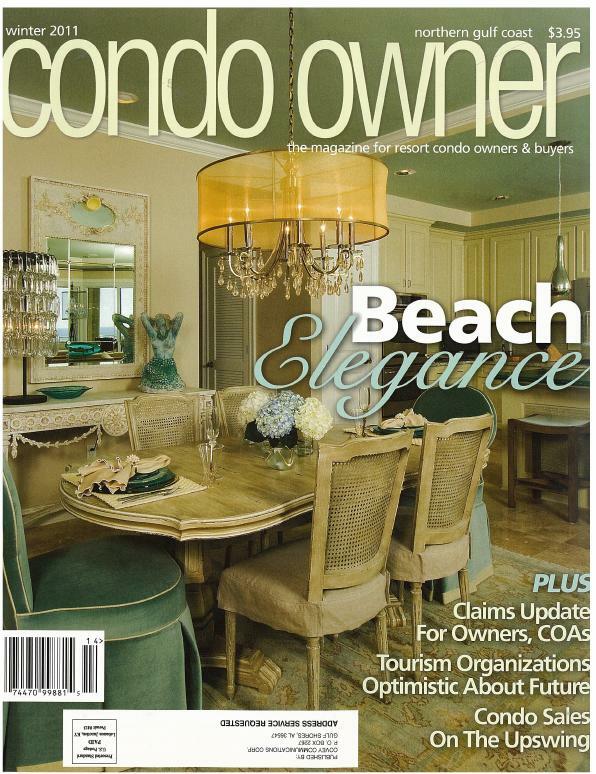 I covered the desk chair in a shimmering ice blue vinyl that picks up on the blue cabinets in the kitchen. 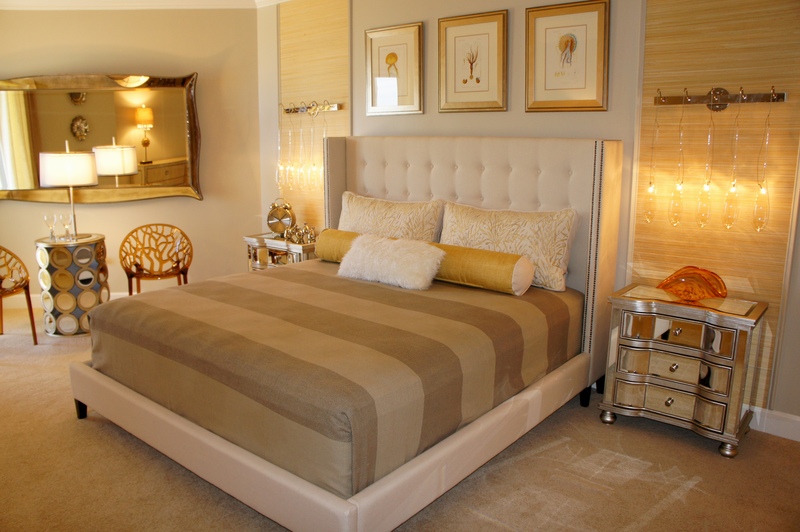 The ostrich leather king bed contrasts nicely with the smoldering charcoal gray wall finish. 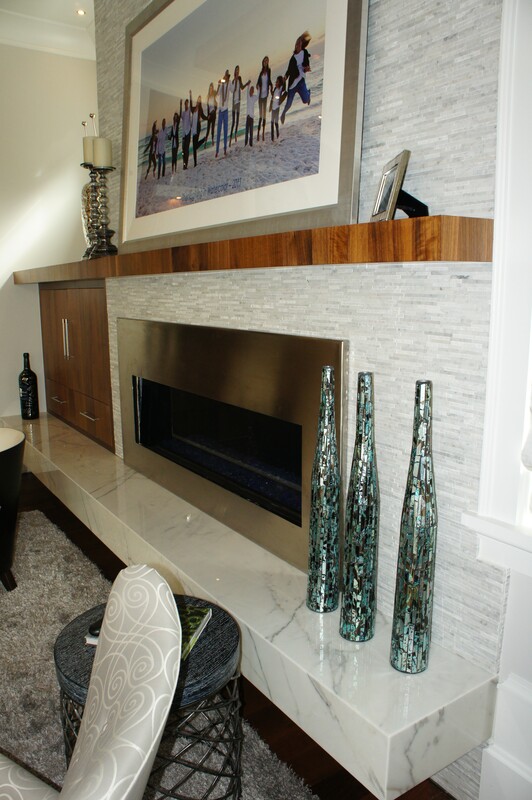 This custom wall design features overlapping lines and planes, a built-in dresser, pearlescent mosaic tile fireplace surround and marble hearth. I love the asymmetry. 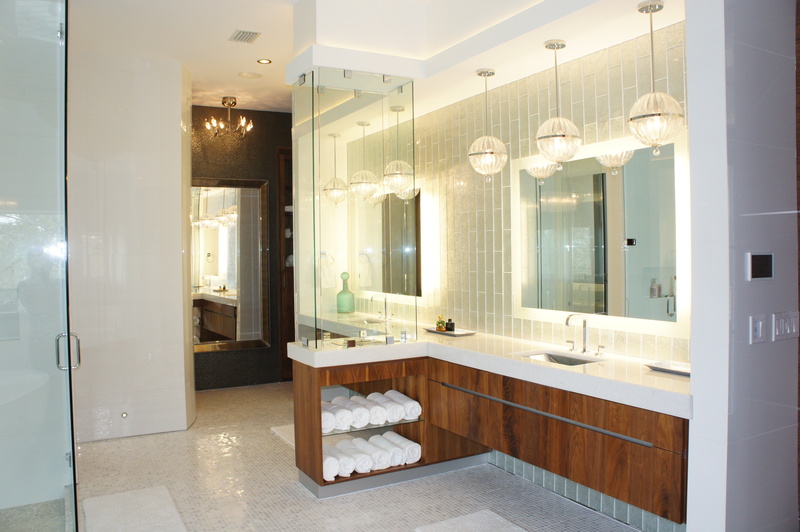 As you enter the Master Bathroom, the first thing you see is the inviting bathing area. 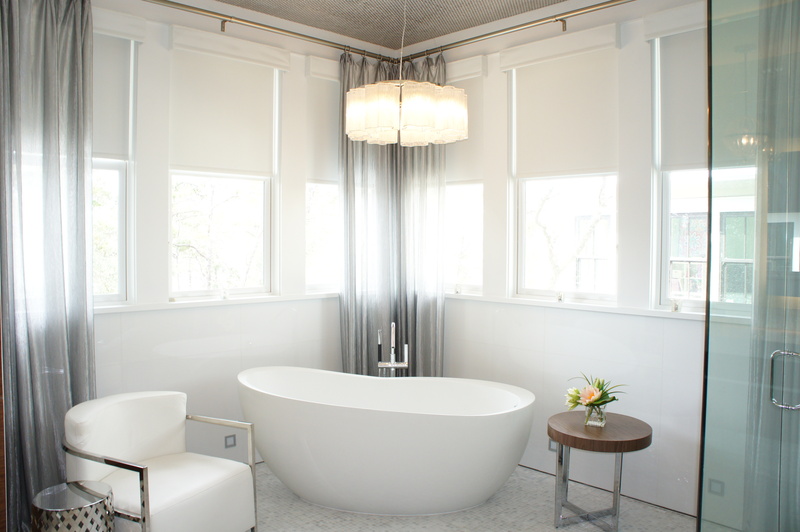 White Ice slab walls, a Waterworks tub, reflective Carrera marble mosaic floors and accents of silver! Turned out beautiful! 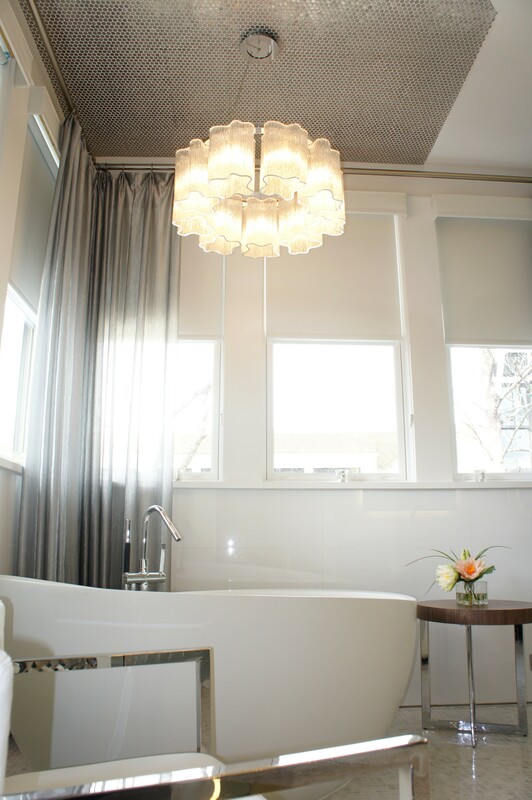 Here you can see a glimpse of the stainless penny round tile we placed on the ceiling above the tub. 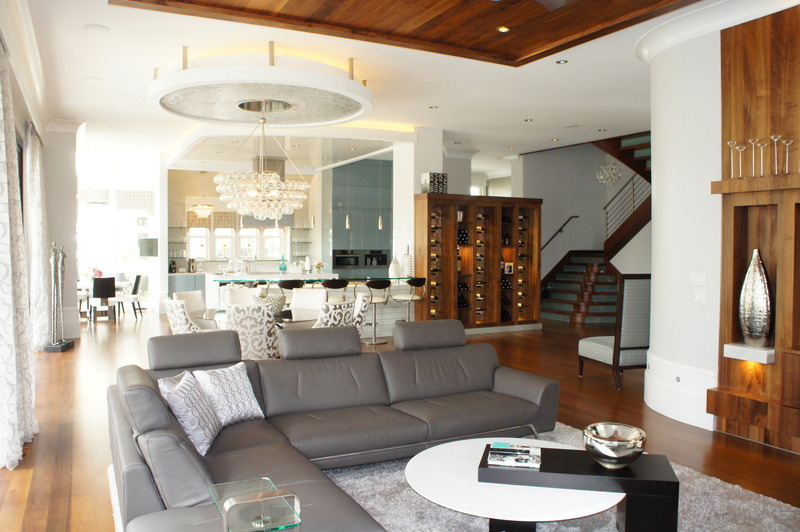 They twinkle against the chandelier, and help define the space, making it more intimate. The silver-thread sheers do this, as well, while adding an ethereal quality. Here is a perspective drawing I did of this area before the area was built. 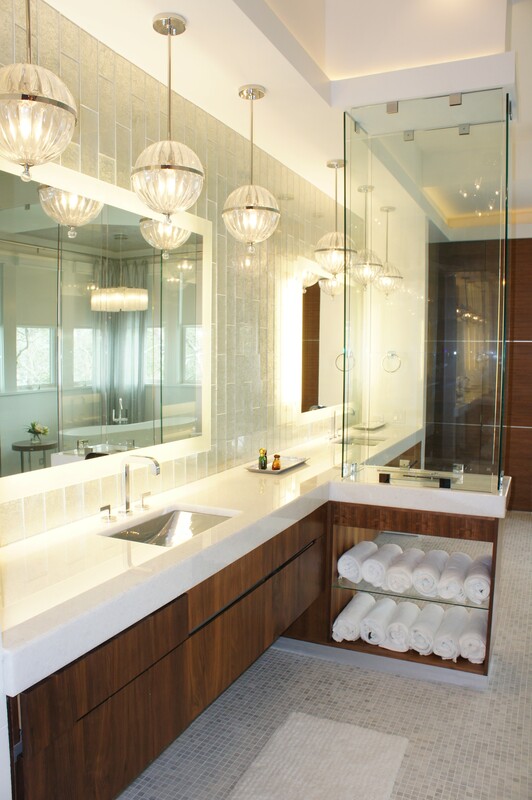 The Vanities consist of custom floating cabinets, shimmering glass “waterafalling” tiles, backlit mirrors, and a floating fireplace! We designed the cabinets so that there would be no hardware, just a stainless reveal with hidden recesses above and below to open drawers. 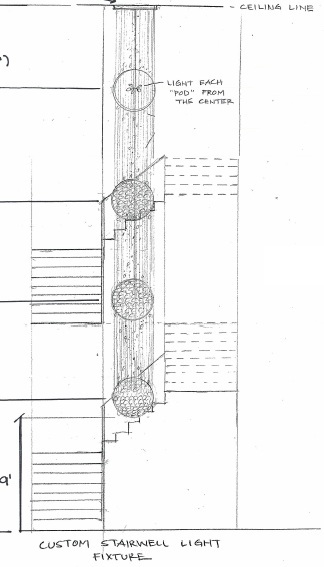 Here is my drawing of the custom stairwell light fixture. 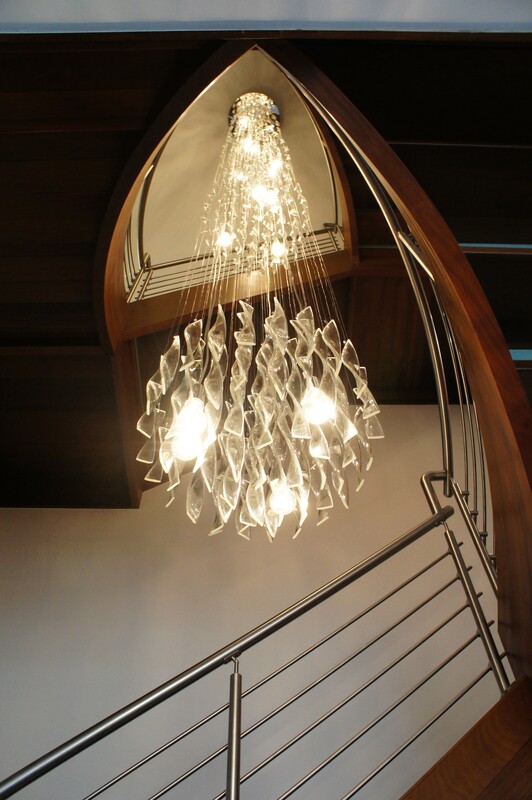 I designed this custom stairwell light to suspend through three stories! Here is my original design idea and drawing, from which this area was designed. This is the bathroom and accesses the Theater Room. 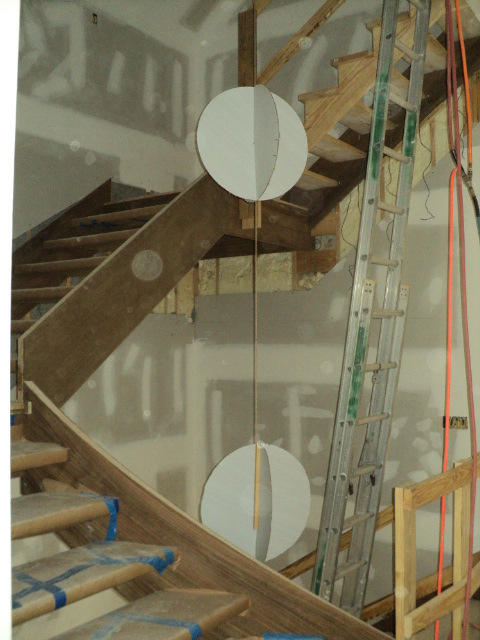 I designed this custom mirror to balance the offset window, and to rotate for flexible viewing. 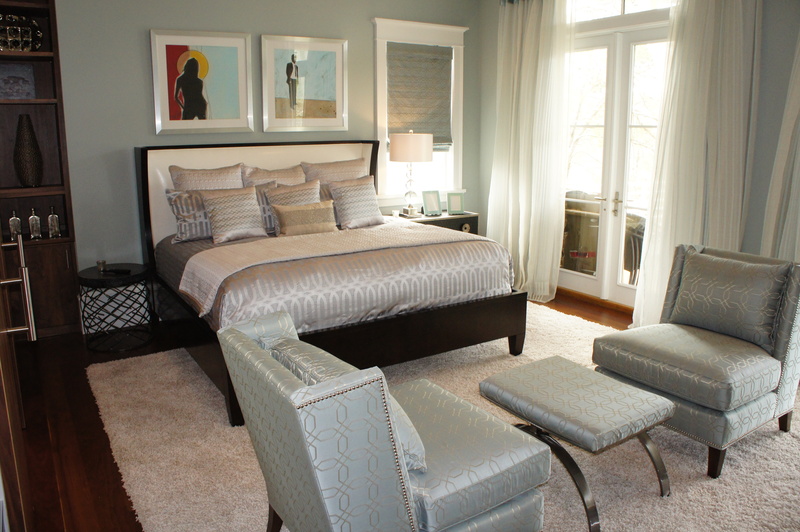 This Guest Bedroom is furnished with a modern King wing bed by Hickory White, a coordinating nightstand, and small round table. 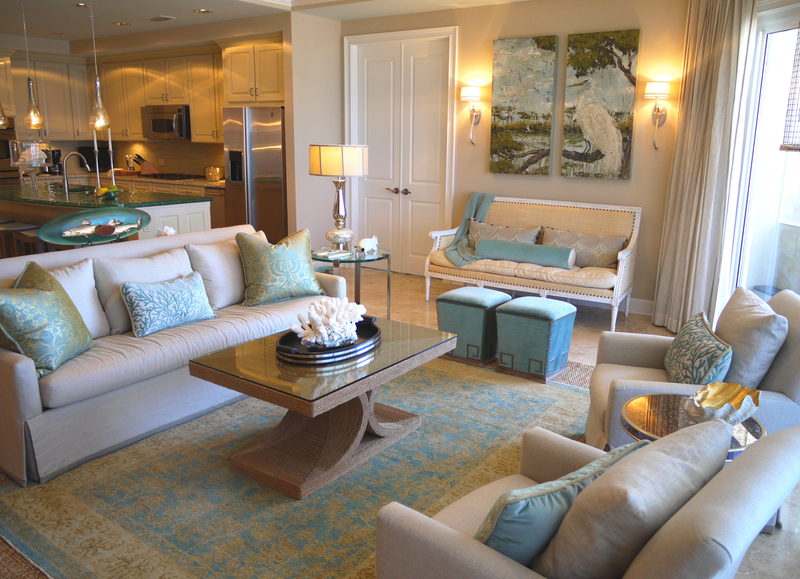 The plush shag area rug anchors the room and provides a soft cushion for the toes! 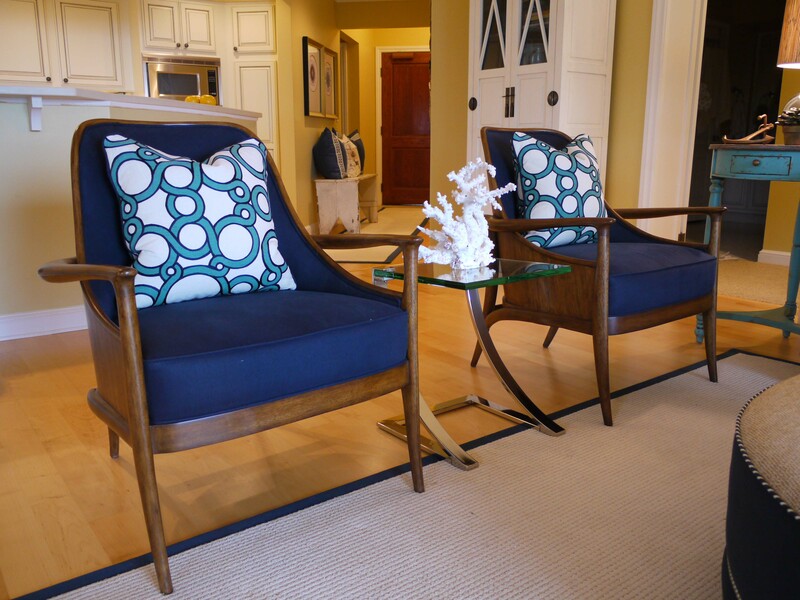 These modern slipper chairs are by Kravet Furniture, and covered in a geometric fabric. The t.v. console is killer!!! It is by Global Views. It is constructed of ebony wenge wood, with organic silver legs and applied sculptural branches. 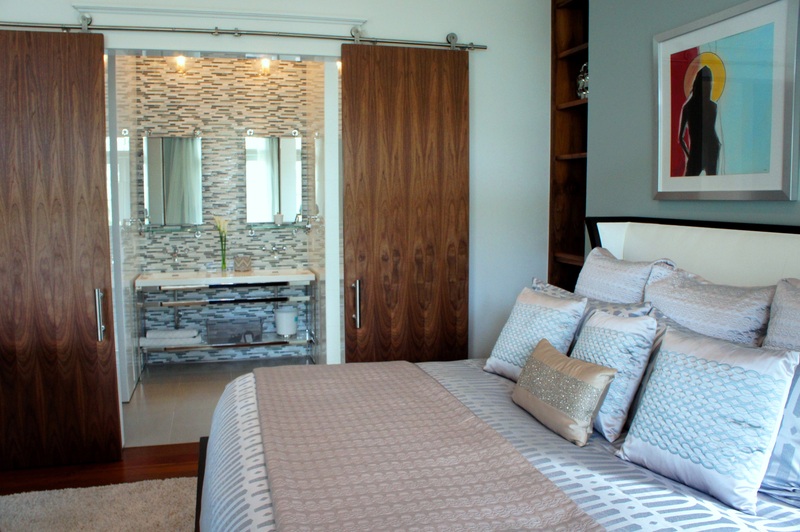 Solid wood sliding barn doors separate the bedroom and bath. My original design elevation and idea for space. 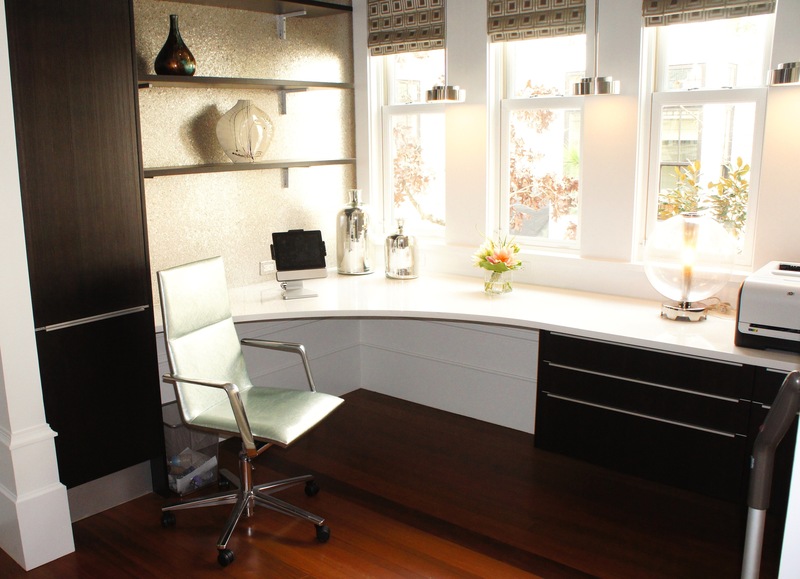 This polished nickel double vanity fit perfectly in this space! 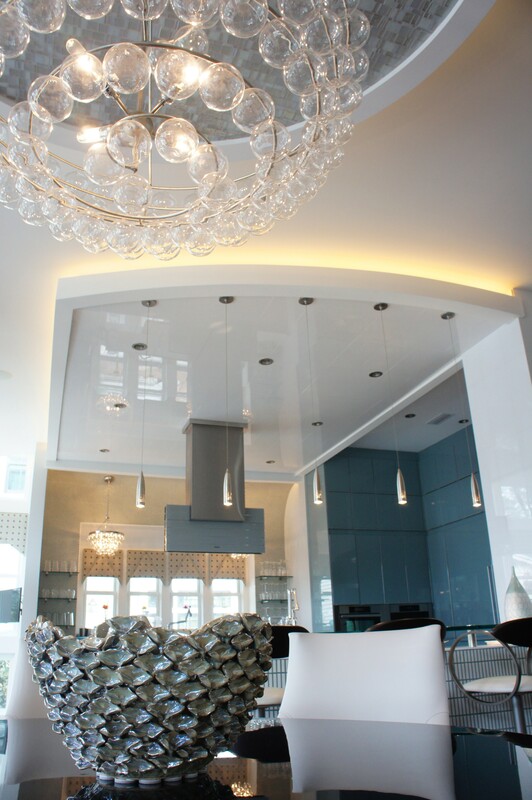 The reflective White Ice walls, horizontal staggered glass and marble tile, and polished metal all twinkle from the lights of the two fabulous “Caviar” pendants by Arteriors. 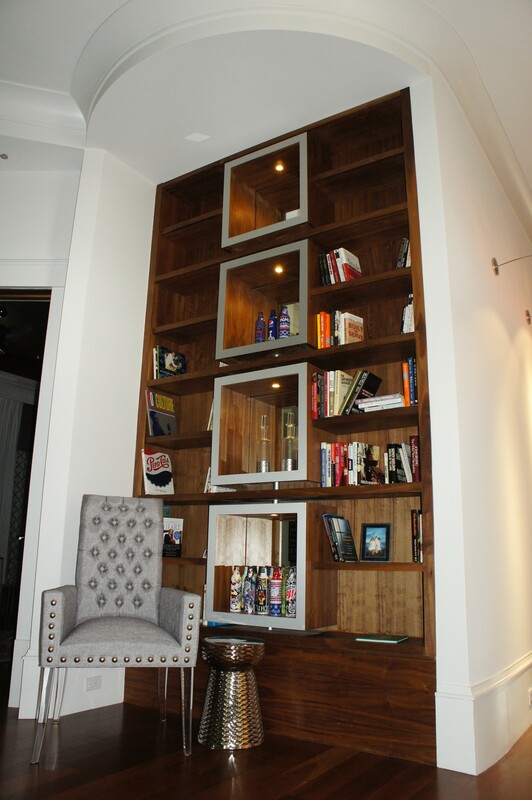 The mirror/shelves are by Waterworks. 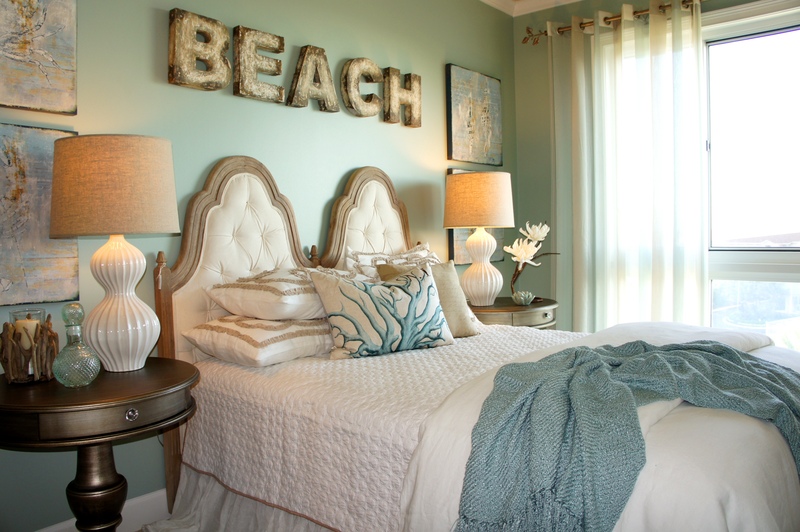 This room belongs to the daughter who preferred a “bohemian beach” décor. 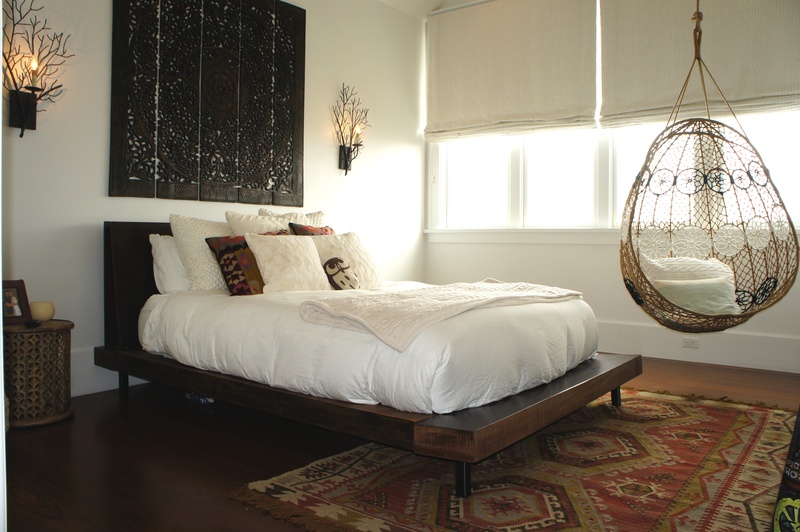 The twig sconces, reclaimed wood platform bed, and wicker hanging egg chair embodied this look. This is one of the daughters’ rooms on the third floor. This one’s taste was that of high glamour, but grounded enough for the beach! 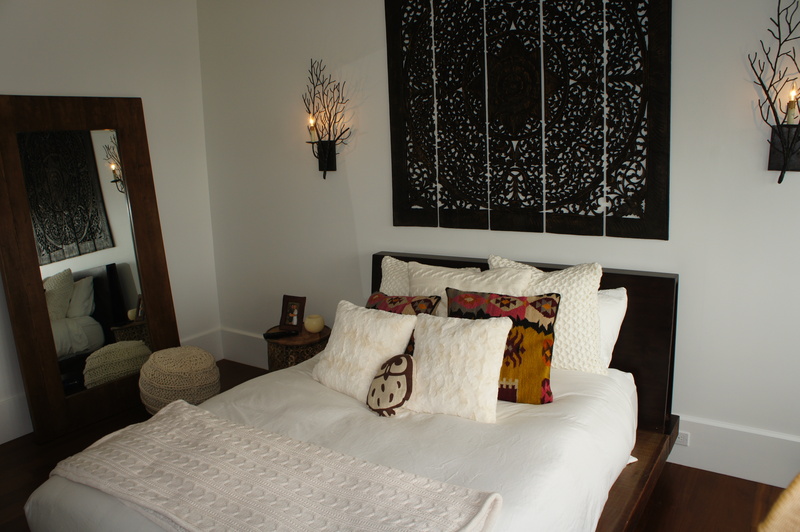 The bed from Oly emphasized just this, with its intricately carved frame and raffia upholstery. The crystal chandelier in the corner created some drama. 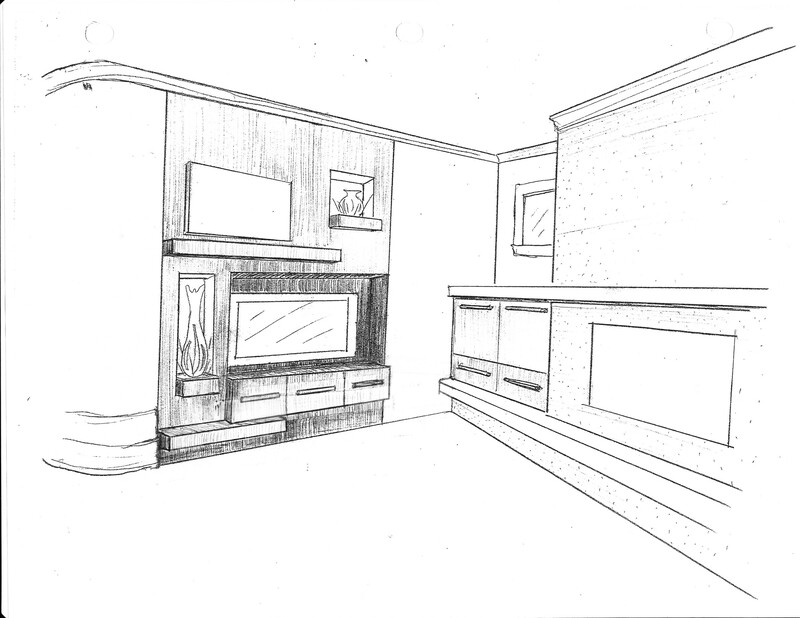 My original design drawing and elevation. Both girls’ rooms have the same bathroom design, except they are mirror images of each other. 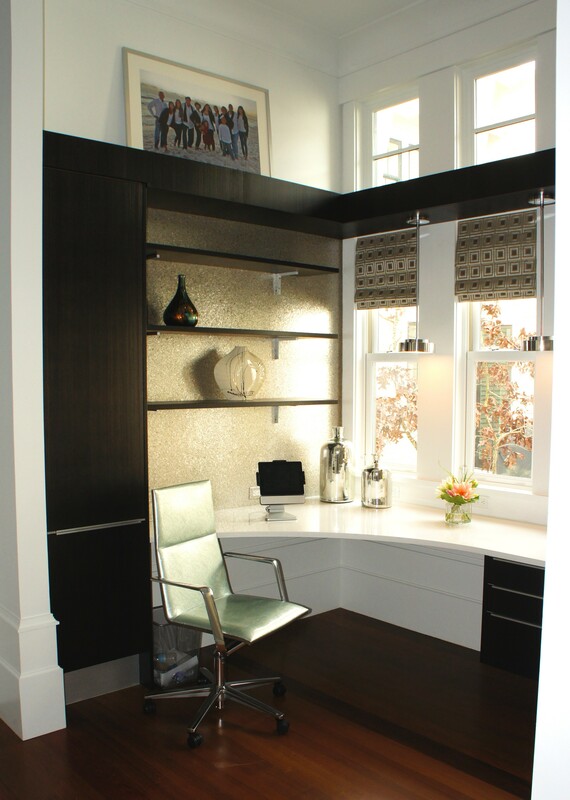 The vanity is a furniture piece that we added a thick solid surface top to so that it looked built-in. 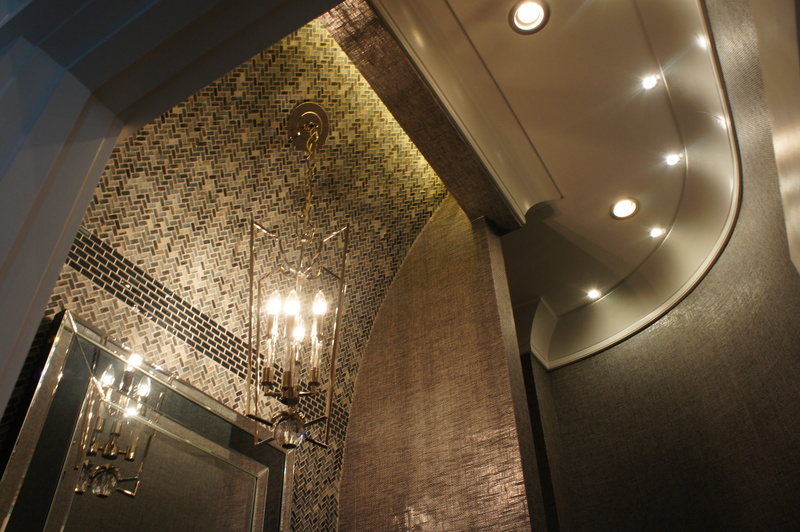 We laid the Bliss stone and glass mosaic tiles all along the backsplash, all the way up to the vaulted ceiling. 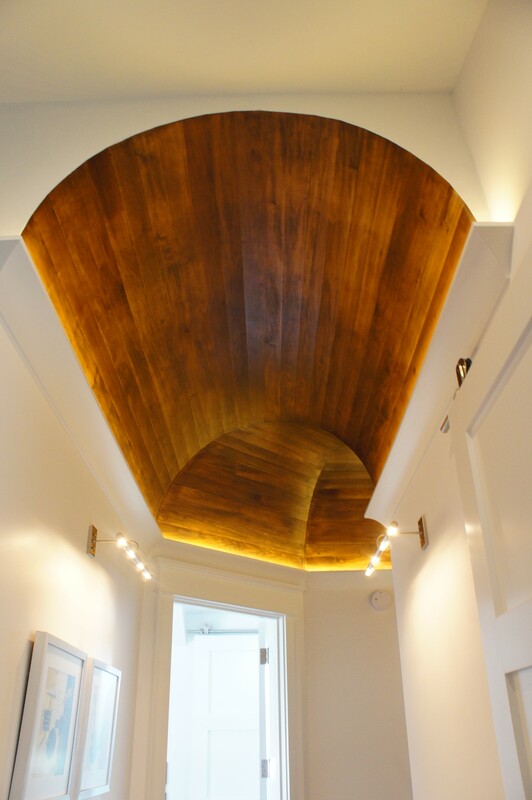 The hallway ceiling on the third floor was a barrel vault, with stained wood for warmth against all the white. 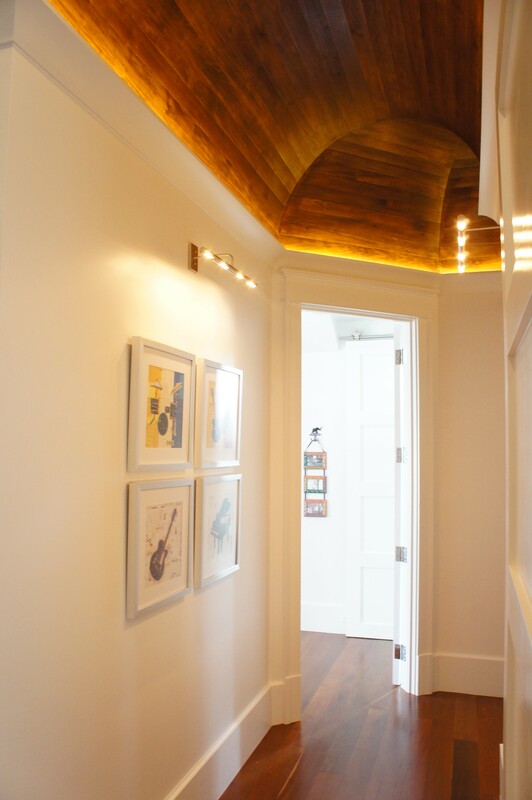 The crown molding hides cove lighting that accents this architectural detail. 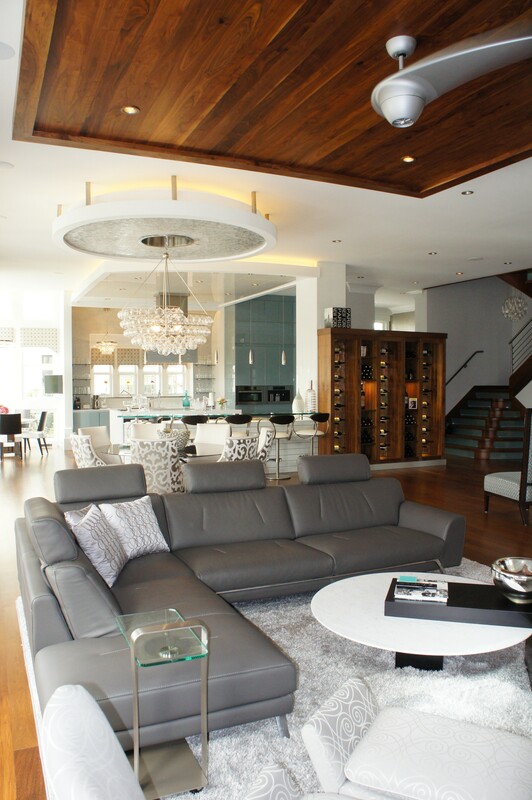 This is yet another very cool way the ceilings were shown some “love” on this project! 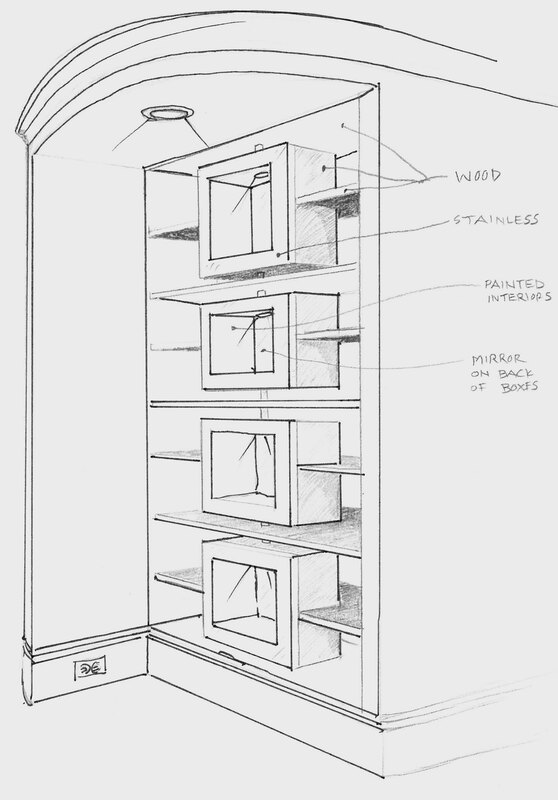 My original design perspective drawing with notes. I do not have a very great picture of this, but I am so proud of this design detail! 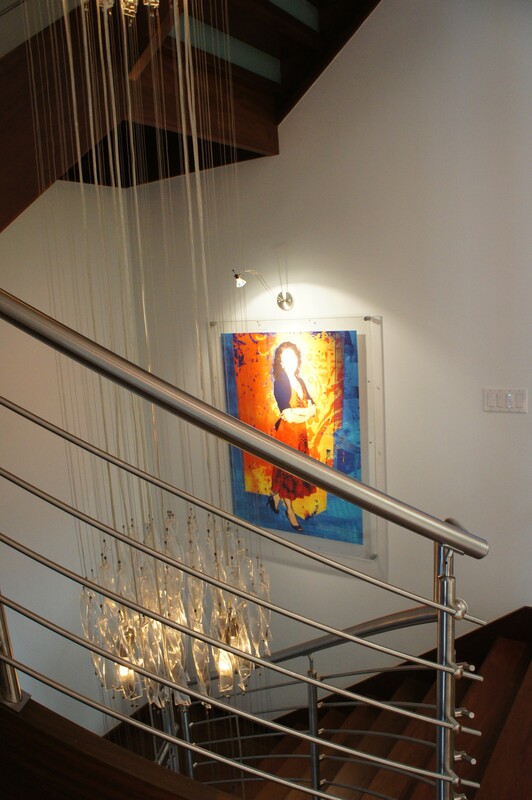 This was another detail constructed straight from my drawings! The cubes are backed with mirrors for depth, and faced with stainless steel. I loved the graphic element. Laundry rooms usually get the cold shoulder in most houses I encounter, but this one is definitely different! 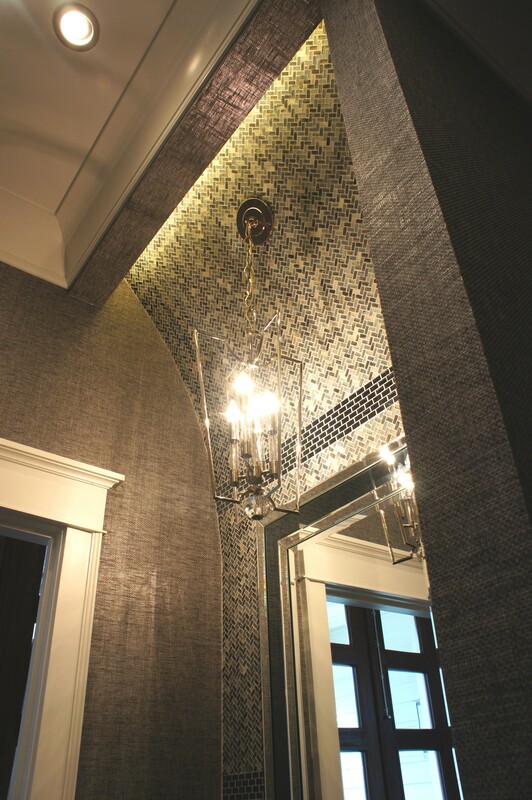 The walls are treated with penny round Ann Sacks tiles with slight gray-blue rims. The slight color creates a gray color contrast for the walls that looks great against the white trim and pale gray cabinets. 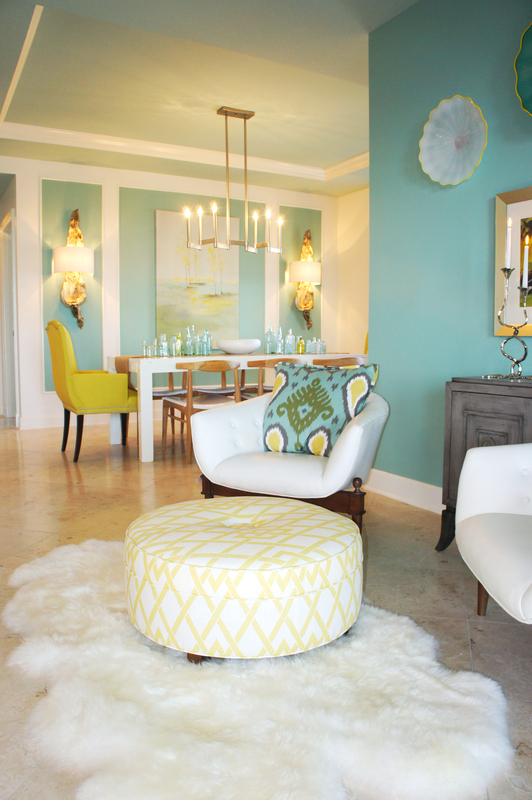 Accent pendant lights add to the charm. 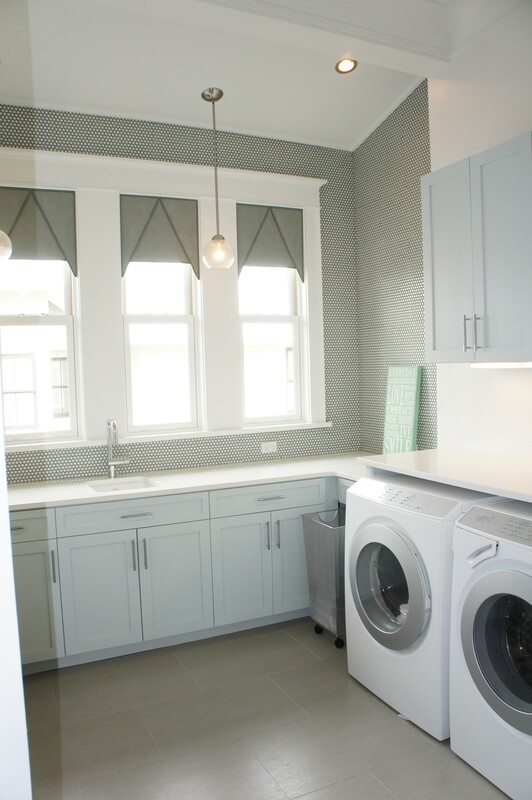 This is the perfect little coastal modern laundry room! Thank you all for visiting my blog! Stay tuned, as I have more complete designs I want to share, with photographs in the works!